Another favorite of 2007, all technicallities in placed and finally the candid moment! who says you can't have great shots in a HDB? 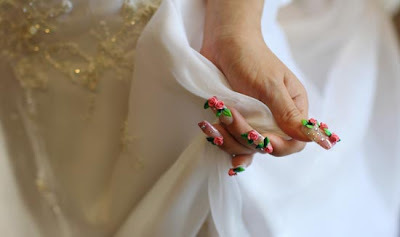 The mother of all manicures I've seen!! 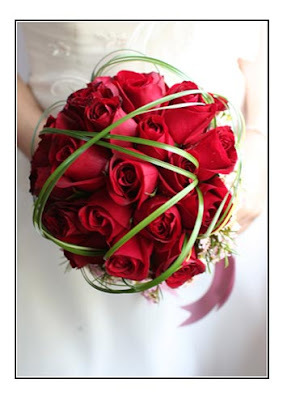 Bride could not use chopsticks nor play mahjong (yes! There was couple of hours of time for it). Love the light, fabric of the gown! A sudden moment, a flock of pigeons just decided to fly past. I had to react within a heartbeat to set my camera almost touching the floor and snapped, fortunately the angle worked perfectly and here you see a few of the pigeons + great expressions of the bride & mom! Priceless!!! 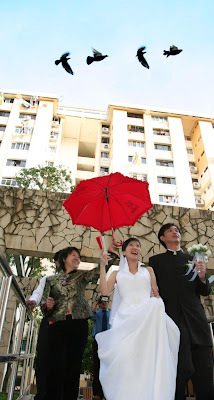 Every march-in is different and it gets my andrenalin up not knowing how the lights are going to be, how fast the couple is going to walk, how the audience are going react. 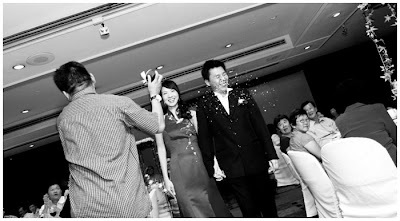 Here one of the guests was throwing plastic-like confetti at the ...groom! A jealous old flame?...with a video camera as proof as-if: "In your face, you *****!!!". 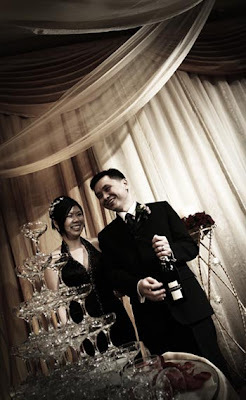 Here's one of my favourite 'toast' shots, as instead of the usual pouring of the champange onto the glass fountain, the couple look great and relaxed against the very nice backdrop of Hyatt! What a way to end 2007! And really looking forward to start shooting 2008 on the high!